Hi fronteria thanks for sharing this a nice little piece of history and an original receipt. This forum isn't very lively, us two appear to be the only members that have posted on it resently. Has it always been the same? Jeff it all depends on who's browsing the forum and at what times. I know at times it is quiet but its still got a knowledgeable following of member's. Use varies a great deal over time, & no doubt will continue to it may also be your own interest that alter how you see use of the site. I shoot & do not collect although have owned a lot of pistols in the past up to 10 @ a time. 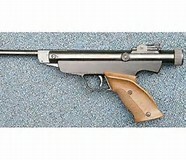 I have NO interest in Webley (Wobbly) pistols although its one of our busy sections!!. So each to our own? Mike.